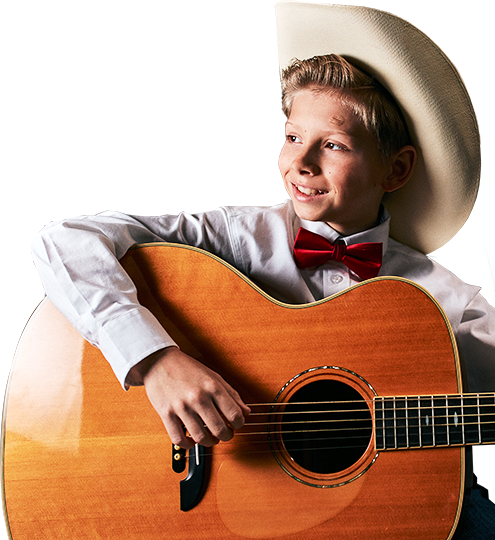 Skyrocketing to fame with an oversized voice, a huge love of classic Country and enormous personality to match, 11-year-old Mason Ramsey is the biggest little star in Country music today. An internet sensation who's captured the hearts of million of fans, Ramsey was discovered in 2018 when a foot-tapping video of the youngster yodeling in a Walmart located in Harrisburg, Illinois, went viral. Since then he's charmed on national television and dazzled the trendiest music festivals, become the youngest Country artist to sign with a major record label in a generation, stood tall on the Grand Ole Opry stage and released an acclaimed debut single, "Famous" – but his journey is only just getting started. "Literally before he was doing sentences and phrases, he was picking up on singing," recalls Daysha Broadway, his older cousin. "Mason is a very old soul when it comes to music – and his temperament and personality." Influenced strongly by icons like Hank Williams Sr., Elvis Presley, Buddy Holly, and Randy Travis, but also by new-school Country and Pop stars including Blake Shelton, Keith Urban, and Ed Sheeran, Ramsey made his first public appearance at the Kentucky Opry just two weeks after he turned four. Wowing the crowd with a dynamic vocal presence that's impossible to ignore, he went on to sing with Country star Josh Turner that same year, opened a show for Gene Watson at age five, and took the stage with the legendary Kenny Rogers at seven. But Ramsey's big heart often shines brighter than the spotlight pointing his way. He loves entertaining the residents of local nursing homes, and since the nearest city is about an hour away from his home, his family would make a day of those trips. They'd stop by Walmart after his performance, and usually the gifted vocalist – who has never taken a lesson – would still be in a singing mood. DeGeneres presented the singer with an offer to debut at the world-renowned Grand Ole Opry – Ramsey's all-time dream. Walmart also chipped in a college scholarship and a globally-streamed concert. Within weeks he was touted as a high point of Southern California's Coachella festival (where he shared the stage with DJ Whethan), and he backed that up the following weekend by being superstar duo Florida Georgia Line's special guest at the Stagecoach festival. "If someone was ever born to do this, it was Mason," shares Broadway. "Whether it's a nursing home show or a giant festival, he says, 'It's just a whole different world that makes me feel really good.'" A heartwarming, aspirational anthem which speaks to his quick rise to stardom – but also finds him promising to forever stay a big-hearted country boy – the track was written by hitmaking tunesmiths Tyler Hubbard (of Florida Georgia Line), Corey Crowder, Sarah Buxton and Canaan Smith, and was produced by studio aces Joey Moi (Florida Georgia Line, Jake Owen) and Crowder (Chris Young). Mixing Ramsey's crystal-clear, all-natural vocals with the classic sonics he loves so much – plus a few modern touches – "Famous" bridges the gap between fans of traditional and contemporary Country … and it's just a hint of what's to come for the first breakout star of 2018. Be the first to get updates about Mason! Welcome to Mason Ramsey's mailing list! Sign me up to discover more artists like Mason Ramsey and other offers.